Thé BÜ, this baby looks like a wine cooler, it’s not too sweet but also not very fermented tasting…yup that’s right my sweets it’s just right. 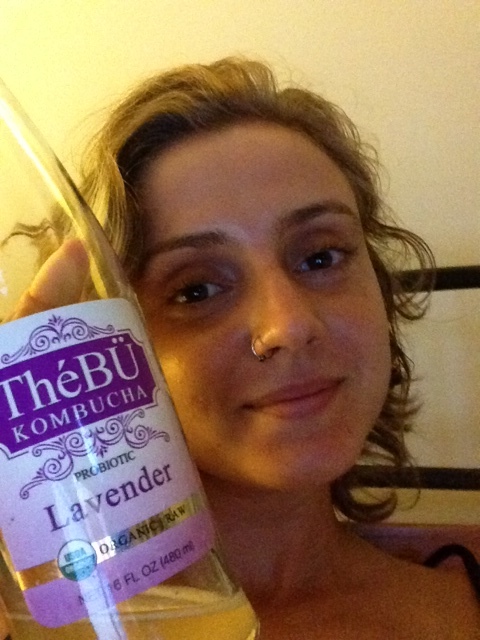 There are four flavors Thé BÜ Kombucha comes in; Tangerine, Lavender, Tropical and Melon. The Tropical and Tangerine flavors are the least noticeable, followed by Lavender which is a bit more of an after taste while the Melon flavor straight up tastes like the liquid form of a Watermelon Jolly Rancher (which I keep saying Jolly Ranger and none of my friends have told me the proper name! Come on guys!). depending the flavor green tea or black tea is used so there is a small amount of caffeine. The company has guaranteed that their product is alcohol free. I just started following this company on FaceBook and saw that they even have their kombucha on tap at some WholeFoods stores and a few restaurants! So why Thé BÜ Kombucha over other kombuchas? This brand uses the GanedenBC30 probiotics strain, this strain has been greatly studied and researched with wonderful results. There are only three grams of sugar per serving, this is a sparkling sweet and low calorie drink. I personally enjoy having a kombucha after a fantastic work out or later at night when I am getting myself ready to cuddle up to a book in bed. My two favorite flavors currently by this company are Melon & Lavender. These flavors are unique and truly compliment the times of days I enjoy kombucha (melon in the morning and lavender before bed). Getting ready for book time! « Green Figs? Black Figs? Why Should I Give A Fig?! I intend to try it, especially the lavender [I love lavender], and when I do, I will let u know how it goes. I completely agree with your opinion that this kombucha is “just right”. I tried it when I was visiting in San Francisco at Christmastime, and when I was back in the area again, I walked three miles in cold drizzle (I’m not very hardy when it comes to cold) to get a fix of The Bu’s honeydew melon flavored kombucha. I’d been trying to like kombucha in order to have a another source of probiotics in my diet, but I had no success until I tried this one. I LOVE it! It’s the only beverage that might be as habit forming for me as coffee in the morning if I could only find a source in my part of Florida. I’m calling up all the markets I can to put it on their radar.